Local currencies are being developed in locations around the world. An inspiring, effective and influential part of REconomy work within communities. Exeter, in the UK, is due to launch later this year. Rob Hopkins visited the team to hear more. A couple of weeks I took the short train ride to Exeter to meet Ian, Melanie, Adam, Martin and Gill, the group working hard to make the Exeter Pound a reality. With their launch set for September 1st I wanted to find out how’s it going. How did the idea come about? How did it step up to become a reality? 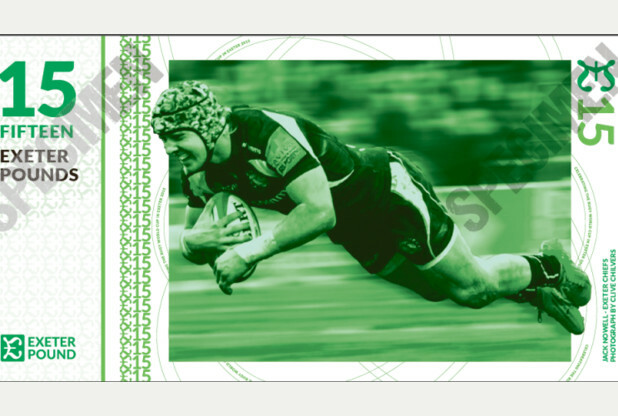 Did you know that a successful launch of the Exeter Pound is Exeter City Council’s second highest economic priority? Or what links a group of black gospel singers who toured England in the early 1800s, the Rugby World Cup and the Exeter Pound £15 note? Or the role New Economics Foundation’s ‘Clone Town Britain’ study had in inspiring the Pound? All is revealed in our “everything-you-could-ever-want-to-know-about-the-Exeter-Pound” podcast. 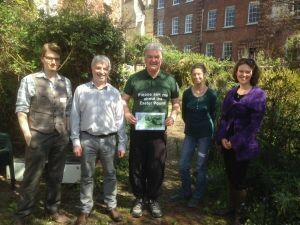 Keep up with developments at www.exeterpound.org.uk. Originally published on the Transition Network website May 5, 2015, by Rob Hopkins. Will you offer collectors packs and the special £15 limited edition? If so would like to buy. Perhaps you would let me know in due course .Thank you, Mike Hurrell.